TheWirk.com ~ voted BallHyped.com's 2010 "Best Independent Sports Blog": SpoonEllen Spoon ~ "Living the Dream"
I've actually had the pleasure of meeting SpoonEllen numerous times. She's always looked nothing but glamorous -- definitely the snazziest utensil in town. Plus, SpoonEllen is always the life of any party. She may not have much to say all the time, but she's a great listener. What else could you want out of a party guest? SpoonEllen is fantastic! When I saw her, I had to ask the lady next to me about her. Those outfits are excellent... Would love to take a peek at that wardrobe! 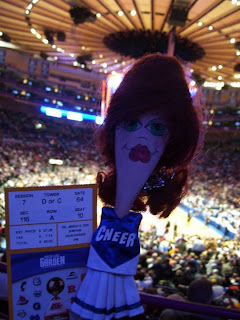 I've also had the pleasure of hanging with "The Spoon" as I affectionately call her in NYC. If I'm not mistaken, I think she may have also met Chris Evert. Now, to get her to Augusta next month for a priceless shot with Tiger! I saw the pictures with Tracy Austin, but Billie Jean King is visually more iconic. As for Augusta, if SpoonEllen scores a pic with Tiger, she would definitely be my hero! I have hung out with SpoonEllen on many occasions, and I must say she is always dressed to impress but not in a DIVA way. She is gracious and kind and makes herself available to all. The Spoon is not only fashionable but a huge sports fan. She loves to attend live events in an appropriate outfit. I am sure her Spring/Summer schedule will be jam packed! Thanks to Sarah Wirk for the great write up!